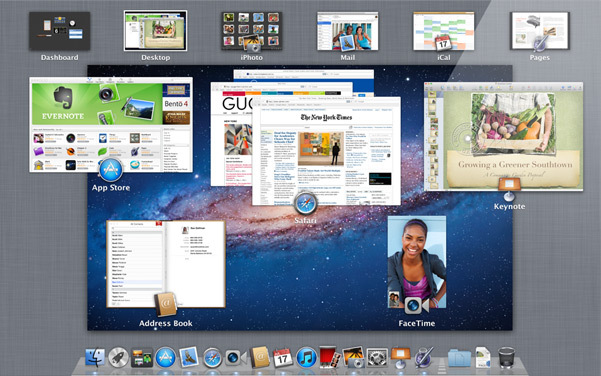 Mission control is where the user can see and navigate everything running on your Mac. Mission control explains itself; Apple brought ExposÃ©, Dashboard, Spaces, and full-screen app to one place. To use Mission control, you swipe with three fingers on your trackpad. You can also click the Mission Control icon in the dock, and your desktop zooms out to Mission Control. You can also use gesture navigation. By using this you, swipe up and your desktop zooms out to Mission Control. Swipe left or right to more to the next or previous Mission Control item. In Mission Control, at the top of your desktop it shows your Dashboard, desktop spaces, and your full-screen apps. At the bottom or middle of your screen, it shows an ExposÃ© view of the open windows. ExposÃ© groups window not the same application. So if you have tabs from different windows from safari, it will group those items together to make it easier for yourself. The spaces on your Mission control depend on the user. You can also add and remove desktop spaces from Mission Control itself to add a new space, click the new Spaces control (+) in the upper-right corner of Mission Control. To remove a space, click the delete button (x) on the space’s thumbnail. You can also bind an application to a space to make it ready for spaces right from the Dock. You can do this by pressing and holding the icon in the Dock and make a selection from the contextual menu. Leave a comment below and we will answer it as soon as possible. I want to get the tabs at the top of mission control to zoom when i hover over them – this was the default on a different account on my mac, but on the one I use it isn’t and i can’t find an option to tick anywhere that will allow me to change it.